If you are not part of the building industry, the terminology thrown around can be a bit confusing. Do you know the difference between a manufactured home and modular homes? How are they different from stick-built houses? Which one is right for you? Picture a rectangular box sitting on top of a concrete slab. That is a manufactured home. Manufactured homes, or mobile homes, come from a factory and set in a mobile home park or on a piece of land. Normally, they are rectangular in shape and have about 1,600 square feet of living space. We call them “mobile” homes because you can move them from one location to another. Depreciation on a mobile home is similar to that of a car. Over time, the appraised value decreases significantly, and owners may find that they do not receive anything back on their investment. However, the initial cost is less, and they are portable, so there are situations where mobile homes make sense. If you are looking for temporary, inexpensive housing, then a mobile home might be an option. You are probably most familiar with the traditional building process. The homeowner purchases a piece of land and secures a builder for their home. The builder then contracts out the various parts of the job: roofing, drywall, concrete, plumbing, electrical, etc. All the work is done at the building site, and the structure is permanently affixed to the piece of property. A traditional house, or stick-built home, is highly customizable. With the help of a good architect, you can design any building you like. This flexibility comes at a price though: the cost of custom stick-built house is high, and you also run the risk of “what’s on paper” not quite working on the field. Unlike a mobile home, traditional houses increase in value over time. They must meet local building codes and therefore, you know the quality of workmanship at least meets certain standards. Before moving on to talking about modular homes, we need to make an important distinction. Like a mobile home trailer, a modular home is constructed at an indoor facility and transported to the building site, but that is where all similarity ends. A prefabricated house or modular home must meet very strict state and federal building codes. Like a site-built home, inspectors regularly sign off on work as it is completed. In fact, not only do modular homes have to pass all the same inspections as traditional houses, but they also go through additional inspections from the manufacturer’s Quality Control Department. In many ways, the building of a modular home is more tightly scrutinized than any other type of home construction. It is imperative that the fabrication falls within tight tolerances so that everything fits as it should during assembly. Therefore, extreme attention to detail is important during every step of the construction process. Once assembled, modular homes look no different than traditional houses. In fact, very few people can tell the difference. Modular simply means: “constructed with standardized units or measurements.” If you build a home in the traditional way, a builder would assemble the various modules (walls, staircases, roof, etc.) on site. With a manufactured or modular home, the same components get built in a controlled environment, to the strictest of specifications. They are assembled into “modules” and transported to the building site. Once there, the modules get “married” together with drywall and trim where they connect throughout the home. The resulting home is strong, beautiful, and ready to move into. One of the main differences between a traditional stick-built home and a modular home is the quality of craftsmanship. Stick builders have to make adjustments on the fly to the fit and finish of the stick-built home as problems occur at the site. Contrast this with the modular home, systematically built by highly trained and specialized workers, and carefully inspected piece by piece in a controlled factory environment. When your new modular home arrives on your property, it fits together perfectly. On average, you can expect your building costs to be about 15% less when purchasing a modular home. Building in a controlled factory environment results in a MUCH more efficient process than building on site. Imagine the chaos at a site-built home as various helpers bump into each other and cross hoses and wires as they fight for workspace in your house! Contrast this with the systematic and highly efficient modular building process, developed over decades, with every person staying at their workstation and only doing what they are the very best at. Another reason modular homes cost less is that the manufacturers buy materials in bulk and can negotiate better pricing. Very little construction waste is generated since any leftover materials can be used on the next home being built. This all adds up to more savings for you! Like stick-built homes, a modular home goes up in value over time, because it IS a stick-built home (just built in sections!). You also have the benefit of built-in equity. Let’s compare a modular home and a traditional home appraised at the same value. The modular home costs less to build, therefore you have to finance less money. If you sold your home, you would receive more cash in hand because you owe less on the property. 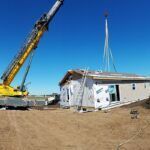 The average time to construct a custom modular home is 90 to 120 days, including building the garage, attached porch, installing the septic system, well, and doing any other site work. Contrast this with a stick-built home, which typically takes 8 months or more to complete. In fact, 8 months might be pushing it. Everything depends on the availability of plumbers, electricians, framers/roofers, and any one of a dozen other sub-contractors that work on a site-built home. Obviously, a market exists for all three types of homes: manufactured/mobile, traditional, and modular. Which one is best for you depends solely on your circumstances. If you want inexpensive, temporary housing, then a mobile home might suit your needs. 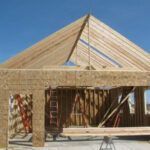 For homes that need a high level of customization, and where there is no budget because the cost is not an issue, you might want to hire a stick-builder. However, for those who want all the benefits of a custom home without the drawbacks of hiring a stick-builder, modular should be a serious consideration. Well-built and versatile in design, the modular home has all the traits of a stick-built home without the price tag.